The FMC Syntron® J-1 Single Bin Tilted Rack Paper Jogger for easy access single bin to align and feed up to 1-1/2 reams of tightly packed copier paper in sizes up to legal size. The FMC Syntron® J-1 Special 2-Bin Tilt Rack Paper Jogger has the ability to hold two trays of checks at one time. Perfect small, compact jogger for the banking industry, printers, food industries, product testing and packaging. Easy handling of magazine inserts, coupon flyers and catalog supplements and is available in 17 x 22 inch or 14 x 20 inch decks. The J-50-B Flat Deck can jog up to 50 pounds. 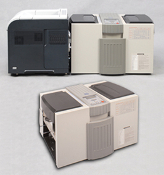 The FD 4170 Cut-Sheet Burster is the ideal finishing solution when multiple forms are printed on one page. The Formax FD-4400 industrial strength cut-sheet burster is specifically designed to process Check21 IRD’s and other documents printed on perforated cut sheets. The Formax FD-574 Cut-Sheet Cutter is uniquely designed to process forms generated from a digital printer, up to 44 forms per minute. The Formax FD6102 inserter offers the latest technology in entry-level tabletop inserters, making it possible for any business to automate its mailings. The InfoSeal PS-100 folder sealer offers quality and robust construction not found in small to medium volume machines which are in its class. A small volume solution offering very quiet performance in an attractive package. 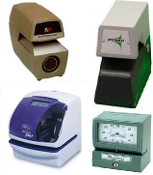 A dependable and reliable mid-range Desktop Pressure Sealer and is one of our most popular models.